The processing of abrasive materials presents particular challenges for the quality of the tools used. The use of carbide specifically lends itself to this. It is considerably more unbreakable than ceramic and significantly more wear-resistant than steel or other materials. With the use of this resilient and durable material, you improve the service lives of your components significantly and thereby increase the availability and capacity utilisation of your systems. 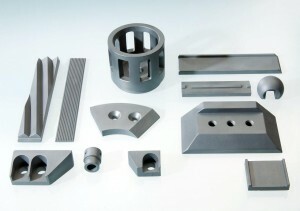 Carbide is excellently suited to diverse processes with a high level of wear potential, such as mixing, chopping, extruding, grinding and blasting. On the basis of your ideas and purposes, we develop and manufacture durable wearing components – carbide tipped or made of full carbide.